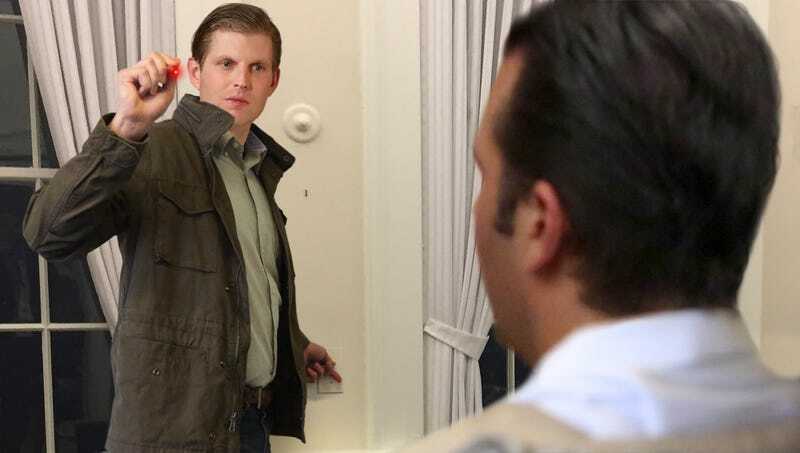 WASHINGTON—In response to resurfacing allegations that cast doubt on his brother’s version of the 2016 Trump Tower meeting, Eric Trump aimed a laser pointer at Donald Jr. Friday while rapidly flicking a light switch up and down in order to erase all his memories of the incident. “Come on, Don, keep your eyes super wide open so the memory ray can work,” said the 34-year-old, shining a Trump Organization-branded laser pointer into Donald Jr.’s eyes while repeatedly shouting “You don’t remember the bad stuff! You don’t remember the bad stuff!” “It might hurt for a little bit while the memories are going away, but don’t move or it could give you total amnesia. Here, drink this, too. It’s a forgetfulness potion I made out of all the pills in Dad’s medicine cabinet. He takes ’em all the time and he never remembers nothing.” At press time, a frustrated Eric lost patience and instead opted to use a hammer to smash the memories out of Donald Jr.’s brain.